Heading into the 2016 college football season, many expected the Colorado Buffaloes to finish last in their conference. They went on to have a Cinderella year, winning the Pac-12 South and finishing the season at 10-4. Fast forward one year, and the story is much different. 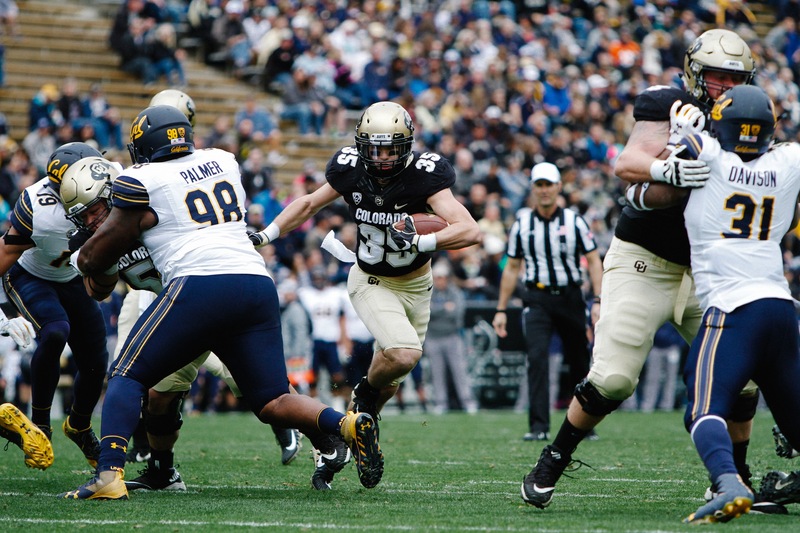 After a extremely disappointing follow-up campaign, in which CU failed to meet lofty preseason expectations, the Buffs finished 5-7, forcing them to sit out during bowl season. Having fallen short of bowl eligibility, and the ability to contend for a conference title, the main question fans are left asking is, was the high standard placed on the team warranted? Given that the Buffs lost eight starters on defense — including three elite defensive backs who gave them an identity on that side of the ball — and their starting quarterback, the bar may have been set slightly too high in 2017. Colorado faced three of the most elite quarterbacks in the country this season, in UCLA’s Josh Rosen, USC’s Sam Darnold and Washington State’s Luke Falk. This was a team bound to take a step back due to the talent and depth they lost last year as well as the quality of their opponents. The Buffs Achilles heel all season long was their run defense, where they gave up 208 yards on the ground per game. One mediocre player after another thrashed through CU’s defense, churning out chunks of yards and wearing them down. The likes of Miles Gaskin, Khalil Tate, Ryan Nall, and Zack Moss all had career days on the ground against the Buffs defense. This season-long nightmare cost the Buffs several games in which they failed horribly in stopping the run. Heading into 2018, Colorado’s run defense must improve if they want the outcome to be different. Next year, the team will be without defensive lineman Leo Jackson III and outside linebacker Derek McCartney, who are both graduating. It’ll be up to incoming sophomores Nate Landman, Dante Sparaco and Jacob Collier, all of whom looked good in limited action this year, to fill that void. The return of talented linebackers Drew Lewis and Rick Gamboa, who for the most part had great seasons, should also aid the Buffs on defense. These guys have great speed, instincts and situational awareness, and the potential to be highly touted NFL prospects at this time next year. In 2018, Colorado should establish more of a rotation at linebacker to keep these players fresh and rested for the duration of a game. In the secondary, signs point to junior sensation Isaiah Oliver departing for the NFL. He is projected to be a first round pick, and has a sky high ceiling with his athletic frame and track background. It would be foolish for him to stay another year given the current opportunity he has to maximize his potential. Assuming he leaves, the team will have huge shoes to fill at the cornerback position. Redshirt freshman Trey Udoffia has been steadily improving, but still has moments where he gets beat bad in coverage. Dante Wigley has impressive athleticism and ball skills, but struggles to use his small frame when matched up against big-bodied wideouts. Luckily, the Buffs are returning safety Evan Worthington, who had a great season splitting time in coverage and playing in the box. He should provide some much needed help in both the secondary as well as the run defense. Another group that most people agree under-performed for the Buffs this year was the wide receivers. In 2016, wideouts Shay Fields Jr., Bryce Bobo and Devin Ross all had outstanding seasons, breaking many school records in the process. They seemed well on their way to having an absolute breakout campaign in 2017. But between miscommunications with quarterback Steven Montez, struggles to get open and poorly timed drops, things didn’t go exactly as planned. Fortunately for Colorado fans, the future at wide receiver is looking bright for next season and beyond. In limited action, tall freshman wideout Laviska Shenault Jr. made several big plays, averaging 24 yards a reception over seven catches. The DeSoto, Texas native gave fans a reason to look forward for what’s to come with his dazzling speed, elusiveness and athletic frame. Shenault should receive extensive playing time going forward, and has the potential to be a star at the position in years to come. Two other players who will top the wide receiver depth chart are Kabion Ento and Juwann Winfree. Fans should look forward to watching them next year as seniors. Ento flashed his big play ability in a limited role with the team in 2016, before redshirting this season. Winfree showed off his athleticism by breaking away from defenses in several instances, culminating in a 163-yard two-touchdown performance against the USC Trojans. That game allowed Winfree to take over Fields’ role in the season finale against Utah, showing Buffs fans he can be a legitimate number one receiver next year. Incoming redshirt junior Quarterback Steven Montez should also make strides in his second year starting under center as he becomes more familiar with the offense. It’ll help that he has a plethora of talented wide receivers at his disposal. He will need to improve in his precision and accuracy, however, to help the Buffs win more games through the air next season without star tailback Phillip Lindsay. Replacing Lindsay will be a committee consisting of junior Beau Bisharat, senior Kyle Evans and redshirt freshman Alex Fontenot. Bisharat has shown to be a short yardage power back, and Evans didn’t get much action this year due to injuries. There are high expectations for Fontenot, who was a highly touted recruit coming out of high school and has a father who played in the NFL. As of now, it seems like he’ll be getting the starting nod at tailback. Overall, due to the sheer number of impact players departing this year, it’s unrealistic to expect the team to win the Pac-12 next year. The Buffs are loaded with firepower on offense, and should have some players that are fun to watch on both sides of the ball. However, between the question marks at several positions, most notably the defense line, and a tough schedule that has Colorado taking the road to face Nebraska and Washington, this team should struggle to meet the sky high benchmark from two seasons ago. Jack Stern is a staff sports writer for the CU Independent. He is a know-it-all sports fan who soaks up anything sports related. His favorite sports are football, baseball, and basketball, but is always excited to learn about, and cover other sports. For story ideas, he can be contacted at jack.stern@colorado.edu or by phone at 718-938-5846.